Today is an unsung day in American history. 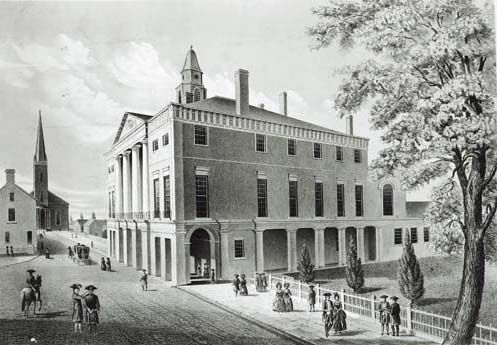 Two hundred and twenty years ago today, concept became reality, as the very first assembled United States Congress, as stipulated in the newly ratified Constitution, met at Federal Hall in downtown Manhattan. The illustration above (from 1789) looks west on Wall Street, past the hall to Trinity Church. You get a good sense of how relatively on the outskirts of town the Hall still was at that time. Federal Hall was the center of American government from that day until December 6, 1790, when Congress moved to Philadelphia for ten years, before its permanent move to Washington D.C. If things look a little odd to you in that picture, they should. 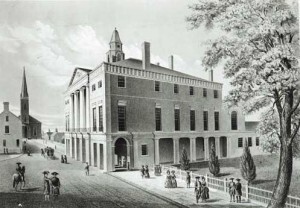 Federal Hall certainly doesn’t look like that today. The current building that calls itself Federal Hall was actually built in 1842, on the same spot as the original, which was ingraciously torn down in 1812. ← Bloomberg’s Time Square plan: a blast from the past?